Welcome to the dark side, and Day #1 of Dark Chocolate Blends Theme Week. 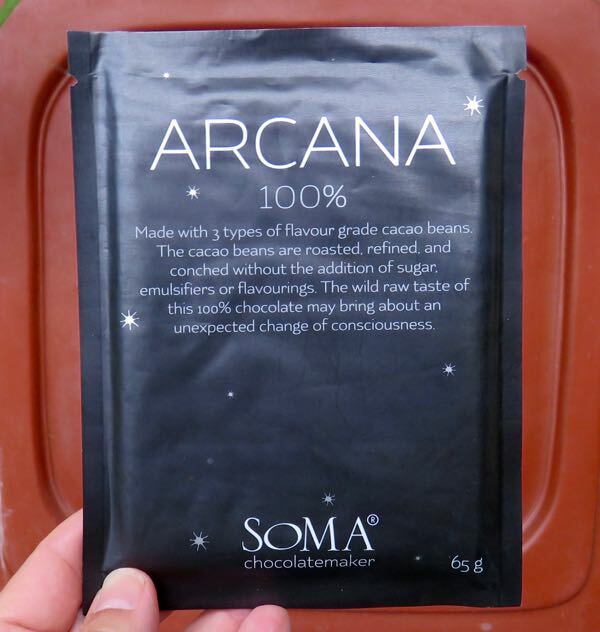 Today's Arcana 100% bar from SOMA Chocolatemaker (Toronto, ON, Canada) was made with cocoa beans from three different origins (Madagascar, Ecuador and Venezuela). The name "Arcana" conjures up images of mysteries that can't be readily explained, and the secrets in nature that alchemists pursued. Blending is probably a bit like this—acquainting oneself with the deep mysteries of each batch of cocoa beans, and finding just the right mix of complementary flavors. 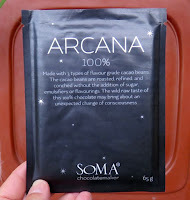 The aroma of this ultra-dark bar had floral, marshmallow and green banana notes (reminiscent of Ecuador); and it was (as is often the case with 100% bars) almost deceptively light. 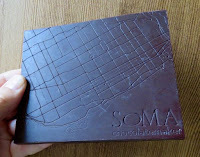 Ah, the brain thought, I am about to bite into a sweet rich chocolate. Then after the first bite, the brain had to hit the re-set button. It had trouble understanding that there was no sugar in this bar. The aftertaste, was much calmer and more subdued. It lingered for quite awhile, with the same floral notes that were present in the initial aroma. And then the brain thought, hmmm. I think I'd like to take another bite.